The robust taste and aroma of rich black coffee with just a hint of cream and sugar. 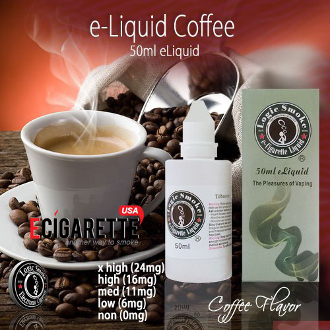 Logic Smoke Coffee e-liquid gives you the all-day pleasure of coffee without the caffeine overload. Great as-is or when mixed with other flavors to enhance it even further. Create your personalized coffee drink by adding a touch of vanilla, chocolate or caramel e cigarette liquid nicotine. With the perfect blend of an 80/20 PG/VG mix (propylene glycol and vegetable glycerin (organic, food grade preservative compounds), you'll get the best flavor concentration along with the perfect amount of vapor to satisfy your vaping needs.